The Arturia synths are portable, affordable, and … weird. And this continues that tradition, with the nicer MatrixBrute keys and a “use every millimeter” patch bay wedged on the side. So now you can use more cables to make things, like, more weird. The MicroBrute, the MiniBrute’s baby brother, actually had very basic patching capabilities – the “mod matrix” let you route the LFO and envelope (or external signal) to control timbre, pitch, and filter. That made it an easy favorite of the Brute line. Translated into simple terms, “plugging wires into jacks for making noises” is what we mean. And of course that can be true if you have just the MiniBrute 2 or if you want to combine it with other analog and modular gear. So, now you get that, plus full-sized keys with aftertouch (as on the flagship, and completely insane, MatrixBrute). 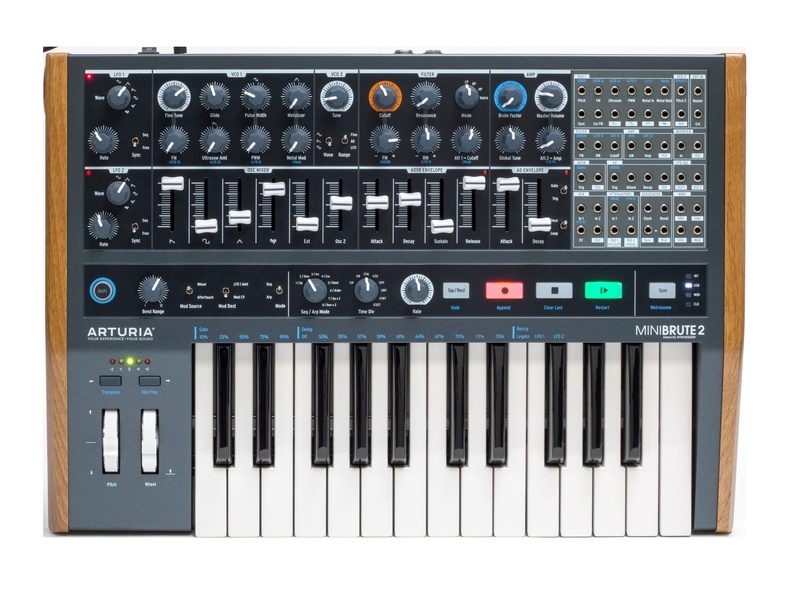 The result could be a real winner: semi-modular architecture plus monosynth plus full-sized keyboard, but still with a low-ish price tag and the usual unique character. So you get patching atop the love-it-or-leave-it wild sound of the original, including the Steiner-Parker filter and that, uh, “Brute” quality – think aggressive, metallic timbres that change wildly as you twist knobs. London’s trip-hop act The Salvador Darlings do the demo. Part of me actually loves that Arturia keeps putting out mental stuff that looks like something someone mocked up on a forum, only real. It’s a safe bet what this sounds like given the heritage, but it’ll be fun to test how that patch bay is to use in practice. Stay tuned (and if you’re at the NAMM show, Arturia will show it there). Available end of February, 649$ / 649 Euro.